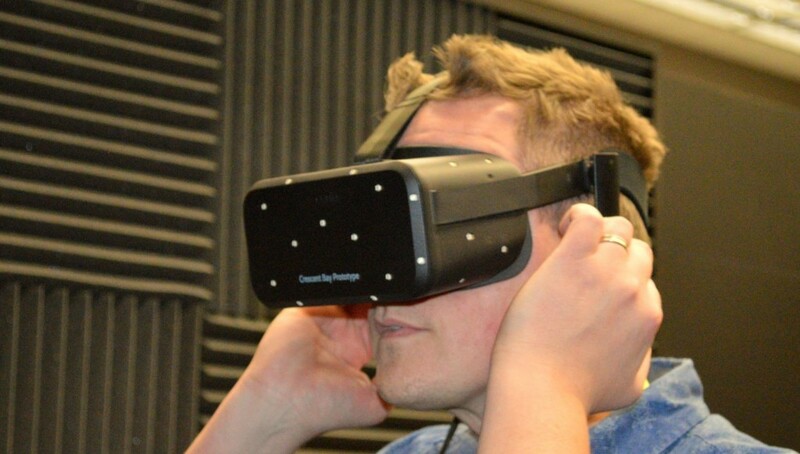 At CES 2015, Oculus brought their latest Rift Crescent Bay prototype to show off at the show. 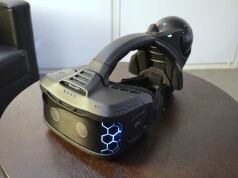 And while the unit remains identical to what we saw at the company’s ‘Connect’ developer conference in 2014, there’s new stuff hidden in the headphones, specifically the 3D positional audio that the company says is key to virtual reality immersion. Oculus CEO Brendan Iribe told Road to VR that the Oculus Audio SDK would be available to developers of the Rift DK2 and Samsung’s Gear VR prior to the launch of the consumer version of the Oculus Rift, commonly called the ‘CV1′. The Oculus Audio SDK will allow developers to tap into Oculus’ solution for 3D positional audio, which makes use of a ‘head related transfer function‘ that processes sounds to give them an accurate position in 3D space, taking into account factors like the shape of the human ear and the fact that, unless the listener is directly facing the origin of the sound, the sound waves will reach each ear at slightly different times. Essentially, the Oculus Audio SDK attempts to digitally recreate the cues that the brain uses to determine the origin of sounds in real life. Oculus announced during its ‘Connect’ developer conference in 2014 that, in addition to adding integrated headphones to their latest Rift ‘Crescent Bay’ prototype, the company had licensed 3D audio technology from Visisonics called RealSpace 3D. 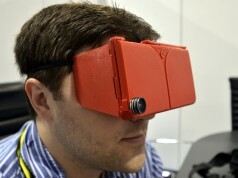 At the time, however, the tech was not implemented into virtual reality demos shown by Oculus. The Oculus team has taken a snapshot of the RealSense 3D implementation and has begun building it into the Oculus SDK, according to Iribe. Once the package becomes available, it will give developers of Oculus experiences an easy way to enrich their demos with 3D positional audio. 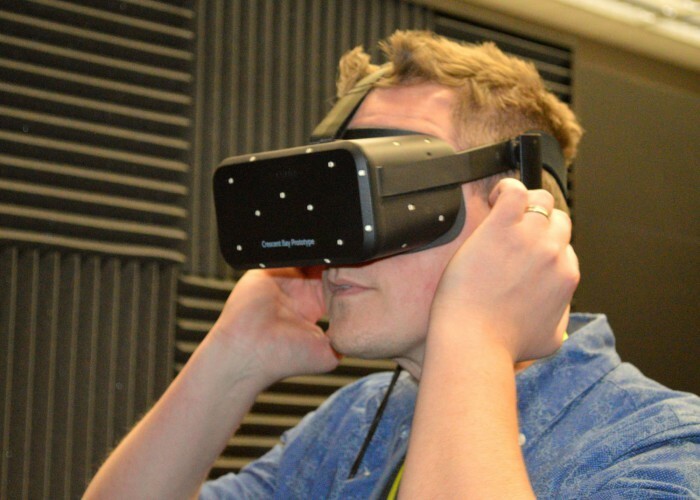 Other implementations of 3D audio have been seen in various Oculus Rift demos, but having a single, consistent method for adding VR-optimized audio is likely to be a boon for developers. “Although HRTF technologies have been around for decades, the addition of precise head tracking makes it much more effective,” says Oculus. On Crescent Bay, Oculus has added what they’re calling ‘VR audio’ to their demo set that’s being used to show off the prototype, which was first seen at the Connect conference in 2014. The Showdown demo from Epic Games is still part of the demo set, but doesn’t yet include Oculus’ VR audio. On Gear VR, Oculus showed a small demo set which included some simple scenes from the company’s Herobound title, and an additional scene that put players on top of a mountain with a pterodactyl flying over head. Road to VR was able to test Oculus’ ‘VR Audio’ on the Rift Crescent Bay prototype and Samsung’s Gear VR, our first impressions are on the way. Personally, i am very excited to see how far oculus goes with this new 3d audio. Just waiting to see what else they figure out.